Over the past 10 years, Dave and I have been blessed with an enormous number of freebies and hand-me-downs from friends, neighbors, relatives, and even complete strangers. Before we had children, people gave us second-hand furniture, decorations, canning supplies, yard tools, plants, and other home goods they thought we would like — based on the fact that we were young, newly married, fresh-out-of-college, and didn’t have a ton in savings. We eagerly accepted EVERYTHING people gave us, until we realized we had no need for anything else. But the freebies kept coming from well-meaning relatives who downsized, grandparents who passed away, neighbors who didn’t sell items at their garage sale, etc. etc. We always just used what we could and either donated the rest or sold it on Craigslist (this is what first helped me get really involved in selling items on Craigslist). After we started having children, the freebies and hand-me-downs seemed to multiply! We have several relatives and church friends with slightly older children who gave us SO much stuff with the intention that we would either give it back to them or pass it along to someone else when we were finished with it. Many of these hand-me-downs were given to us in huge garbage bags or bins stuffed with random assortments of clothing, and we definitely didn’t need all of it. Plus, there were several items we couldn’t even use based on the gender, size, season, personal preference, etc. While we were obviously super grateful to get free (or really really cheap) kids clothing, it didn’t take long for my ultra-organized, type-A, we-need-a-home-for-everything personality to realize there was absolutely NO WAY we could hang onto all the hand-me-downs we got… especially since I had a feeling more clothing would eventually come our way! About 6-8 months after Nora was born, I came up with a list of questions I would ask myself to help decide what hand-me-downs to keep and what I would pass on to someone else. Since I am regularly asked about how I handle kids clothing (specifically hand-me-downs) I thought the back-to-school time would be a perfect time to share the questions that help me control the amount of clothing my kids have without being super minimalistic or feeling like I have to do laundry every other day. These questions ARE in order of importance — at least for my preferences! Until now, I had never actually written the list down, and I don’t spend lots of time debating over every question. Instead, I use these questions as guidelines to help me quickly sort through large amounts of hand-me-down clothing and easily pick out exactly what we needed. Whatever the situation, these 9 questions help me focus on what items would be most useful and most helpful… and then not feel bad about getting rid of (or giving back or passing on) the rest of the clothes. After all, I’d rather let someone else use or buy the clothing I can’t use than to have it sit in my home for 2 or 3 years until I realize no one is going to wear it. How often do your kids need to change their clothing each day? Do they wear separate clothes for playing outside? Do they wear a uniform to school or not? Do you need clothing for all 4 seasons or just “hot” and “hotter”? How many special occasion items will you need? What type of closet do your kids have? Will your kids be sharing closet and dresser space? Even if you are not blessed with lots of freebie hand-me-downs, these questions are still a great way to think about how much clothing your kids really need… and yes, many of these questions work for adults too! Also, I should probably mention that we donate Nora’s clothing when she grows out of it, we pass a lot of Simon’s clothing down to James (and donate the rest), and we have a neighbor friend who gets most of James’ outgrown clothing. Read more on why I don’t sell (or hold onto) our kids clothing in this post. 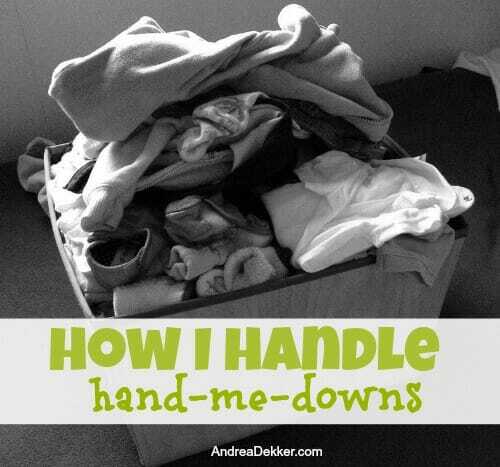 I’d love to know… how do you handle kid’s clothing and hand-me-downs? We hope to adopt in the next couple years, and fostering is also on the table. We have kept all clothing I don’t hate, organized in totes by size and gender, tucked up in the attic. It’s starting to accumulate, but this isn’t space I’d be using otherwise, and I know I can quickly divest if it by age if I ever needed to. My hope is that if we get to foster, if have a fairly complete wardrobe for any child who came to our home, even if it were in the middle of the night with no warning. 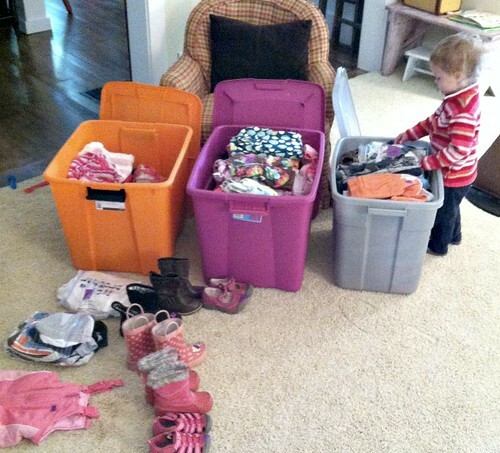 I do have some totes ages that are overflowing and need to be pared down (4T girls clothes! ), but generally it’s one clear tote per clothing size, with card stock labels clearly noting the contents. With my boy clothes (he’s 10 months, I’ve started writing an inventory of the box too, which is helpful when I go to the consignment sale so I see what gaps to fill in. I love this post – so freeing. I have 21 sixteen gallon storage bins filled with kids’ clothes in my basement 🙁 My younger son has worn a lot of his older brother’s hand me downs, mainly because my older son was so picky and only wore the same handful of things over and over. Many items look brand new or stil have the tags on them. However, there was not one pair of size 6 pants in the bin without holes in the knees. 6 year old boys must be hard on pants. These should have been thrown away! I don’t hoard anything else, I promise! If it makes you feel any better, I just want to a garage sale on Friday and the lady confessed to recently MOVING 36 tubs of boys clothing across the state AFTER she had a garage sale. Also, she only has ONE 2 year old boy! We didn’t have many hand me downs since our son was about the same age as the boys in our friends’ families, and we didn’t have any relatives with sons older than him either. I gave away most of his clothes or donated them. I kept a few favorites for grandkids someday and because sometimes it’s just fun to see those cute little outfits again when I go through our storage boxes to declutter! How do you keep track of the clothing that people want you to give back to them when you’re done using it? Do you mark the tags somehow or keep lists of items different people gave you? oh my word! that’s insane! with the price of kid’s clothing these days, there really isn’t any reason to hold onto clothing that long. Turn it into rags maybe! Great guidelines! I used to save everything (because there is always another child in line to use them) but I finally started to get picky about what I save and how much due to space limitations. Inexpensive children’s clothing is so easy to find now with stores like Once Upon a Child and mom 2 mom sales that I don’t feel so guilty passing things on. I just save my favorites and a few items that won’t be dated when the next child is ready for them in a few years. 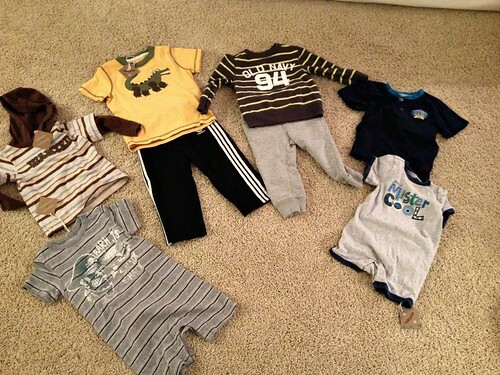 And yes, I’m glad you’ve gotten pickier… it IS so easy to find inexpensive kid’s clothing these days! I have three boys (7, 5 and 1.5). Whenever I receive hand-me-downs, I immediately go through them and only keep that which I really like, that I know I would use if it fit (ie, no snapped pjs, no fancy shoes, etc). The rest goes to goodwill/once upon a child (a used clothing store that buys used clothes). I always ask the giver if they’d like anything back that I don’t use,etc. Always they say no. I have a bin of clothes for each size my children are growing into. With three boys, someone will wear it! My trick is that in my oldest boys’ room, I have a large rubbermaid that sits in the bottom of their closet. Anything I don’t like, etc., goes immediately in the bin. When the bin is full, it goes to be sold/donated. That way, there is always a place for those unwanted/unneeded items. Handing down clothes from one daughter to the other was pretty simple until now they’re almost wearing the same size (at 6 and 4). 🙂 When the last one is done with them, I either give to a friend or consign them at our local kid’s consignment store. That way, I can use store credit to replace for the next season. The only thing I do keep are sentimental dresses that the girls wear. My 81 year old grandfather has been buying my girls a dress for every Christmas since they were born. My grandma used to do the same thing for me and my sister when we were young and my grandpa started doing it after she passed away because he knew it was something she’d want him to keep doing. Turns out he’s got great taste! 🙂 Since they’re the only great grandkids and my grandpa’s health is very poor, I’m keeping the dresses for any other great grandkids that might come along in years to come. Awwww, what a sweet story and a sweet grandpa! I think it’s great that you’re holding on the dresses he gave your girls — especially if future great-granddaughters will be able to use them. 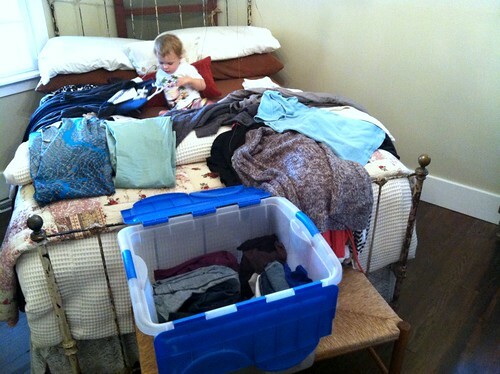 Easy on, easy off–that’s one of my top criteria for what kids’ clothes to keep. Until my little boys are able to do zippers and snaps themselves, they get to wear only pants with elastic in the waist. And I do not understand why people use children’s shoes that need to be tied! Slip-ons or ones with velcro are so readily available and much cuter than they used to be. I love that kids can put them on by themselves, or for the ones who are walking but still really young, they’re much easier for me to put on them. And no shoes for kids who aren’t walking. If they’re not walking, shoes are just one more unnecessary detail for me to keep track of and for them to kick off! I mark things off as I buy them or as people give them to me. Then I can see very easily that I do not need more 4T girls’ leggings, or I do need several polo shirts for my big boy (but not red or blue ones, it says.) Otherwise, I would end up with six pairs of size 5 white sandals, and eight one-piece heavy winter jammies in 4T, since I am a sucker for white sandals and cozy jammies. My “children” are now 30 (a girl) and 25 (a boy). My daughter received a lot of hand me downs from my nieces who were just a little older. Most of my son’s clothing was new as he was quite younger than his male cousins. I did buy some things for both of them at a consignment store near me where I also sold a lot of outgrown clothing, and eventually their crib. The only clothing I saved for sentimental reasons was the outfits they wore home from the hospital, christening outfits and dresses that my mother had hand smoked for both my nieces and my daughter. A few years ago I was able to give their hand smoked dresses to my nieces when they had daughters of their own along with a cradle that my sister (their mother) had purchased and passed down to me. They did not realize that I had it and were thrilled! My sister was a military wife so they moved frequently; I have lived in one home with a basement so we had agreed I would hold onto it. I have a large plastic bin for each of my kids that has their clothing I saved, along with some classic children’s books and toys (wooden train set for my son, American girl doll and outfits for my daughter, a few favorite beanie babies of each, my daughter’s well loved cabbage patch doll and my son’s stuffed animal Simba. I also have a plastic file box for each that contains their baby books, a folder for each school year starting with preschool and ending with their college acceptance letters and catalog. In each year’s I put their report cards, school group photo, sports team photos, any awards and a few samples of schoolwork. My daughter and her husband just bought a house so I will be taking hers to her home when we drive to Texas from Colorado to visit. My son has a condo in town, so I will hang onto his until he moves to a house and/or we downsize,whichever comes first! Sounds like you have a really good system for your kids’ things! Thanks for sharing Carol! Quick question for you. I totally understand not hanging onto the clothes after they grow out of them. I mean, it just never ends and takes up so much space! However, what if you had another girl in a year or two. (Not that I know your family plans or anything, but that’s the situation I’m in and don’t know what’s the best answer). Would you hope to get new hand me downs? Would you just purchase new/used things again? I’m just not sure what to do. I got rid of all my girls’ things as my youngest girl is two, but we’ll be having more kids in the next couple years. 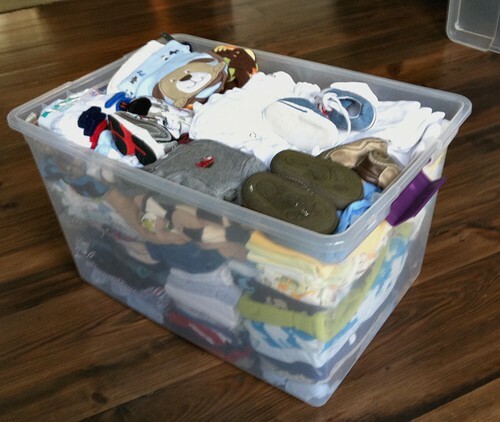 We have a 6 month boy, so do we save his stuff in case it’s another boy or get rid of it? I’m just so torn. I’m not one to keep a bunch of clothes for sentimentality, I’m just thinking practicality. I’d love to hear your thoughts! Thanks! I didn’t start saving hand me downs until I knew I was pregnant with my 2nd. When I knew what gender and season I was looking at, I started building back up my “stockpile” of clothes again. Yeah, that’s kind of what I did with james too! 3. I don’t have a lot of clothing for my babies — only a few outfits for each size, so even if I did have to buy new items from the store (which I highly doubt I would ever have to do) I still wouldn’t spend that much. So for example, I hand onto qutie a bit of Simon’s things right now because James is so close in age and will wear everything next year. However, I don’t hang onto anything from Nora because even if we ever had another girl, they would be 6 years apart (or more) and I’m not hanging onto clothing for 6 years. I’ll let someone else enjoy it and find other options when/if that time comes. 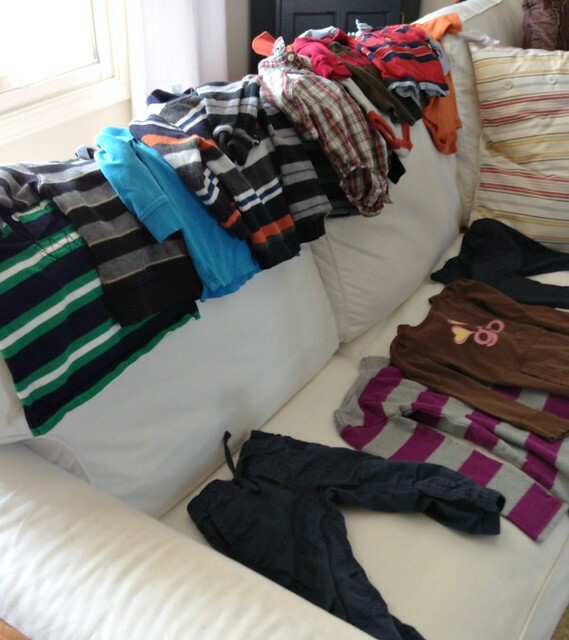 For James’ clothing, I’m getting rid of most of it as he grows out of it… because again, even if we did ever have another boy, I know I could find more clothing at that point, and it’s not worth me storing it just to save a few dollars in the hypothetical future. Thanks, Andrea! I feel so privileged that you answered my question 🙂 But, yes, that makes total sense! I just see my “saved clothes” boxes piling up and it’s freaking out the minimalist in me. I love your thoughts on this – and definitely gives me the “ok” feeling to let all this clothing go. Thank you! I keep a donation bin in the laundry room, but I rarely receive hand-me-down anything. Keeping the kids to a minimum of clothing is relatively easy this way, though – and each one gets 3 uniform blues (the dress, skirt or trousers) and 5 uniform shirts for school. Beyond that, I shop our huge local consignment fair twice a year on the 50% off day. Unfortunately my son is outgrowing those sizes, and men’s clothes are expensive!